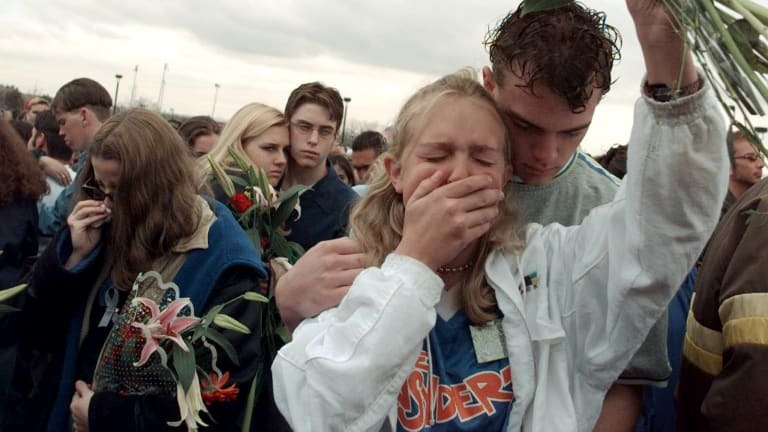 On this day in 1999, two teenage gunmen kill 13 people in a shooting spree at Columbine High School in Littleton, Colorado, south of Denver. At approximately 11:19 a.m., Dylan Klebold, 18, and Eric Harris, 17, dressed in trench coats, began shooting students outside the school before moving inside to continue their rampage. By 11:35 a.m., Klebold and Harris had killed 12 fellow students and a teacher and wounded another 23 people. Shortly after noon, the two teens turned their guns on themselves and committed suicide. The crime prompted a national debate on gun control and school safety, as well as a major investigation to determine what motivated the teen gunmen. In the days immediately following the shootings, it was speculated that Klebold and Harris purposely chose jocks, minorities and Christians as their victims. It was initially reported that one student, Cassie Bernall, was allegedly asked by one of the gunmen if she believed in God. When Bernall said, “Yes,” she was shot to death. Her parents later wrote a book titled She Said Yes, honoring their martyred daughter. Apparently, however, the question was not actually posed to Bernall but to another student who had already been wounded by a gunshot. When that victim replied, “Yes,” the shooter walked away. Subsequent investigations also determined that Harris and Klebold chose their victims randomly. Their original plan was for two propane bombs to explode in the school’s cafeteria, potentially killing hundreds of people and forcing the survivors outside and into the gunmen’s line of fire. When the bombs didn’t work, Harris and Klebold went into the school to carry out their murderous rampage. There was speculation that Harris and Klebold committed the killings because they were members of a group of social outcasts called the “Trenchcoat Mafia” that was fascinated by Goth culture. Violent video games and music were also blamed for influencing the killers. However, none of these theories was ever proven. Columbine High School reopened in the fall of 1999, but the massacre left a scar on the Littleton community. Mark Manes, the young man who sold a gun to Harris and bought him 100 rounds of ammunition the day before the murders, was sentenced to six years in prison. Carla Hochhalter, the mother of a student who was paralyzed in the attack, killed herself at a gun shop. Several other parents filed suit against the school and the police. Even Dylan Klebold’s parents filed notice of their intent to sue, claiming that police should have stopped Harris earlier. And when a carpenter from Chicago erected 15 crosses in a local park on behalf of everyone who died on April 20, parents of the victims tore down the two in memory of Klebold and Harris. The shootings at Columbine were among the worst school shootings in U.S. history until April 16, 2007, when 32 people were shot and many others wounded by a student gunman on the Virginia Tech campus in Blacksburg, Virginia. Subsequent school shootings, including in Newtown, Connecticut in December 2012 and in Parkland, Florida in February 2018, continued to pain the nation. A March 2018 analysis by the Washington Post found that since the Columbine shootings in 1999, there have been 10 school shootings each year on average in the United States.